While the numbers for Fevers are much increased since last month, I have also noted that there has been a great increase in Venereal Complaints. I believe that the increase is due to our anchoring at Halifax on 26 Sept, especially given some of the bawdy tales I've heard the men tell in the weeks following. It is my hope that the unpleasant treatments for the 'diseases of Venus' will keep the numbers low after our next visit to port. 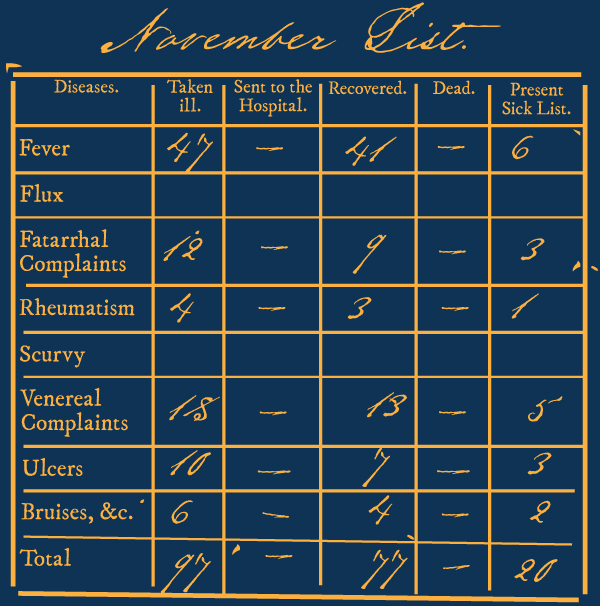 Compiled and submitted for the month of November by Ship's Surgeon A. Roberts, HMS Acasta.